Our team of specialists around MRK pioneer Dieter Faude works closely with your company to develop the perfect MRK system solutions and applications from individual component modules. 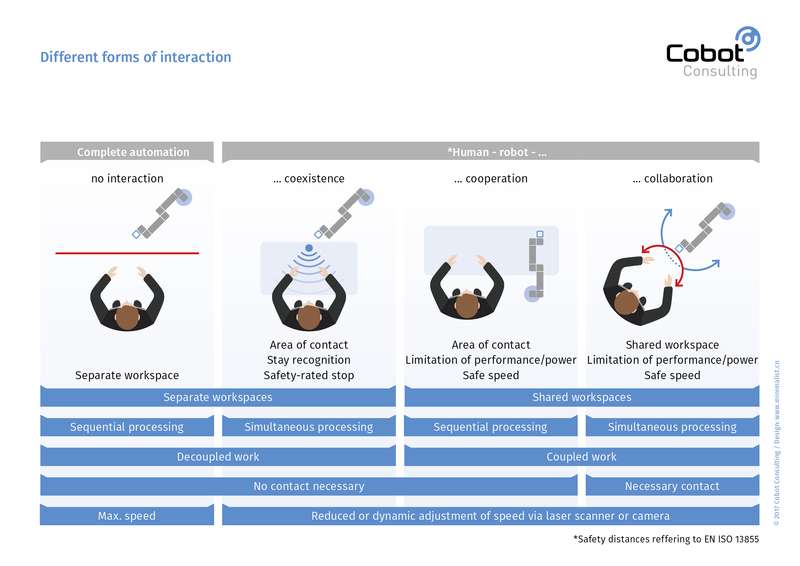 Cobot has developed a guideline which is vital for the success of your production processes as the application combines end-effector (tool), robot, your product and your work environment. We support you every step of the way. Firstly, we provide a short analysis of your specific requirements and develop a customized concept and guidelines for each customer that includes your individual abilities. Our consultants work with you on the design, develop an organizational analysis and finally move on to the implementation into your production processes. We accompany you on the way to the certification of your product to save time and money. Technology only fulfills its purpose if it does not pose a threat. Even in the early phase of a product development, it is advisable to get in touch with the right contact to ensure a targeted and thus efficient development. Our partners can offer you ready-to-use MRK system solutions and applications. We also have a wide network of suppliers that deliver individual components or custom made mechanical parts. We work very closely with BGHM and IFA (DGUV) to make sure that CE compliance is always up to date. We have been specializing in industrial facilities for over 25 years and your project will benefit from our extensive industry know-how. As we offer a variety of different solutions, we can support each customer according to their specific needs without any supplier restrictions. The successful implementation of such complex projects require careful and rigorous preparation and planning. To develop a successful system, we must take a variety of important factors into account such as organizational structures, legal requirements, standards, technical conditions and the importance of a homogenic implementation into existing infrastructures. 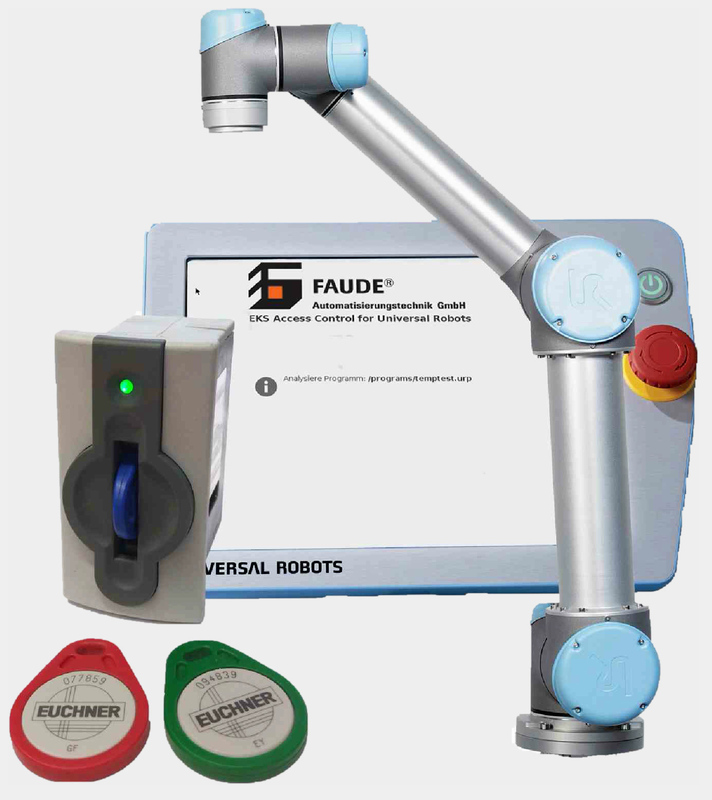 Our specialty is lightweight and MRK applications with Cobots from the manufacturer Universal Robots UR3, UR5 and UR10 and we have been working with Software Safexpert from IBF Solutions AG for more than 15 years. Our highly innovative technology continuously improves your existing production processes. Your standard automation systems will be enhanced by changes to scalable automation solutions with focus on ‘CoBot’ automation. Cobot offers you the opportunity to profit from the Internet of Things and to build a 4.0 serial production line. The ‘adaptive factory of the future‘. We want to support the German industrial market in its efforts to become more successful and more innovative. As an automation specialist with ingenuity, we design tomorrow’s factories, production plants and assembly lines with the highest quality standards – for a digital future that is safer and more intelligent. We support you in the selection of the ideal production assistant from a large variety of currently available brands. A collaborative robot (Cobot) is an industrial robot which works collaboratively with humans and is generally not separated from them during the production process by any type of safety device. 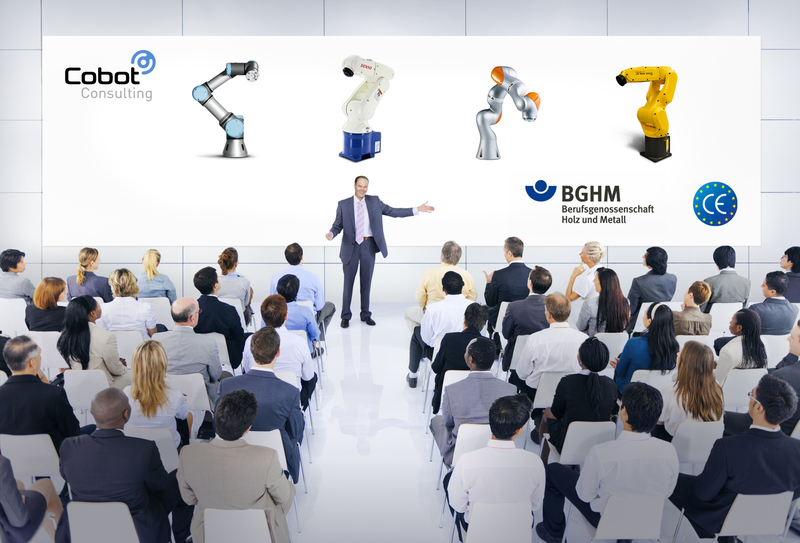 They are available in a variety of specifications and designs from a number of manufacturers such as Universal Robots – UR 3,5,10 / KUKA AG – LBR iiwa / Rethink Robotics – Baxter / Fanuc – CR-35iA / Bosch – APAS assistant / ABB – YuMi / KBee – Franka Emika / Denso Robotics – Cobotta / fp-robotics / Yaskawa – Motoman HC10 / Comau – AURA / Festo – BionicCobot / Hanwha – HCR-5 / Kinova Robotics – JACO² & MICO² / Stäubli – HelMo / Schunk – gripper systems. 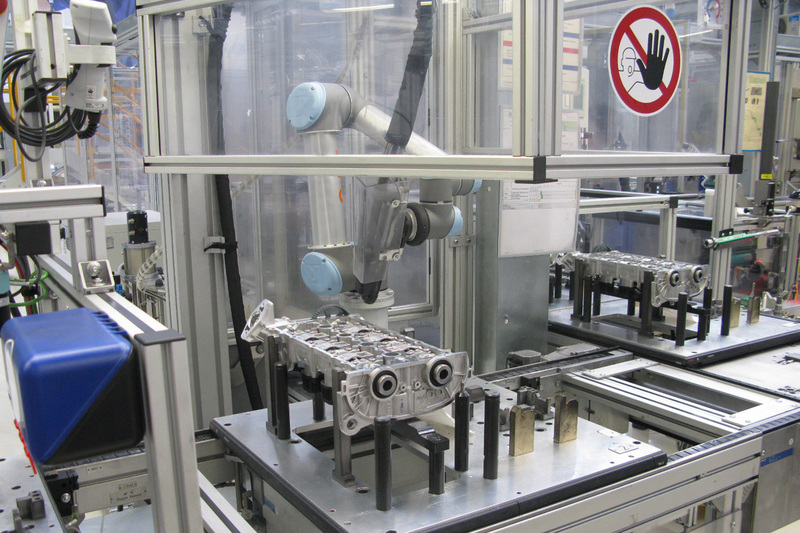 Standard industrial robots are usually working in separate areas. Cobots, however, work hand-in-hand with humans. They have sensors that register the movements and position of the employee. With this technology, they are safe enough to directly assist the workers in their task without the risk of causing injuries. 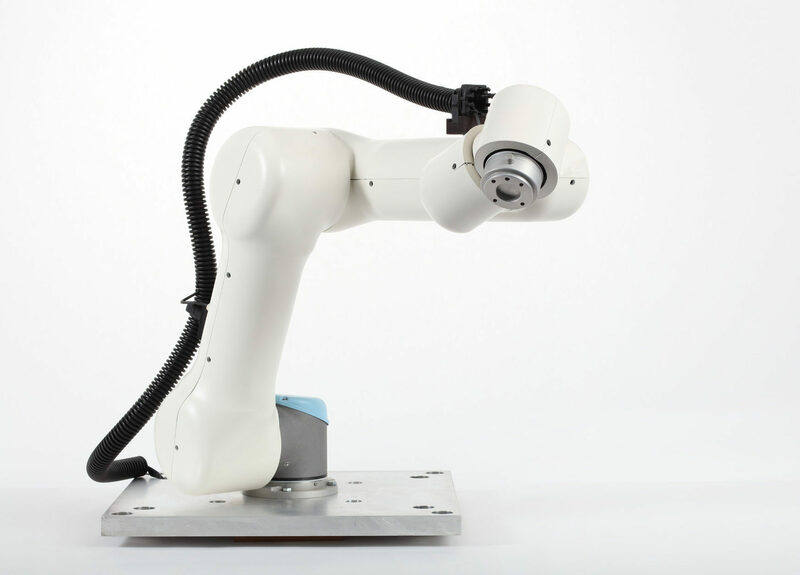 Cobots are flexible, easy to program and easy to move around. Weighing sometimes only 10 kg, the collaborative, lightweight robot can be lifted easily by one person and be installed at any desired location. For three years, we have been part of a task force within the DGUV (German Social Accident Insurance) / BGHM that focuses on safety in the area of robot-human collaboration. The social accident insurance is part of the German social security system. Carriers of the ‘social system’ are public bodies which are controlled by the government. Carriers of the DGUV in Germany are commercial trade associations. We have been working with the IFA Institute for 5 years in the area of robot-human collaboration. IFA supports the DGUV and its institutions in Germany mainly in the area of health and safety at work within the technology and science sector. The pillars of the social accident insurance system are outlined in the Seventh Book of the German Social Act (SGB VII). For many years, we have been exchanging our experiences with MRK with the Fraunhofer IFF. 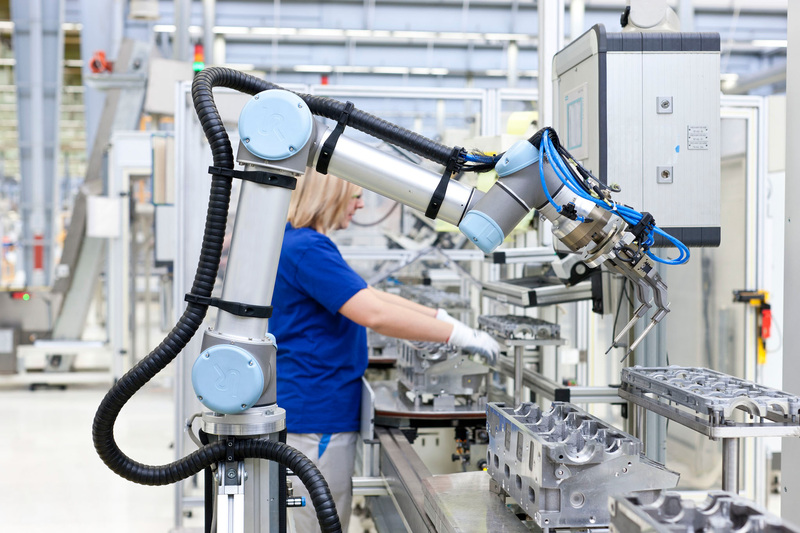 The robotic systems department of the Fraunhofer IFF is developing new vital components and technologies for future robot units and complex robot systems for the manufacturing industry and within the scope of government research projects. We have been working closely with the GDS2 School in Sindelfingen for 15 years and for the last 4 years, the chairman of the GDS2 foundation worked for our company. With approx. 2150 students, the school is one of the largest education centers in Baden Wuertemberg. The school’s foundation was established in 1984 and has since then become one of the most successful providers of advanced education in the region. be leaders in our digital world of tomorrow.